Please share with friends and family using the share buttons..thanks. 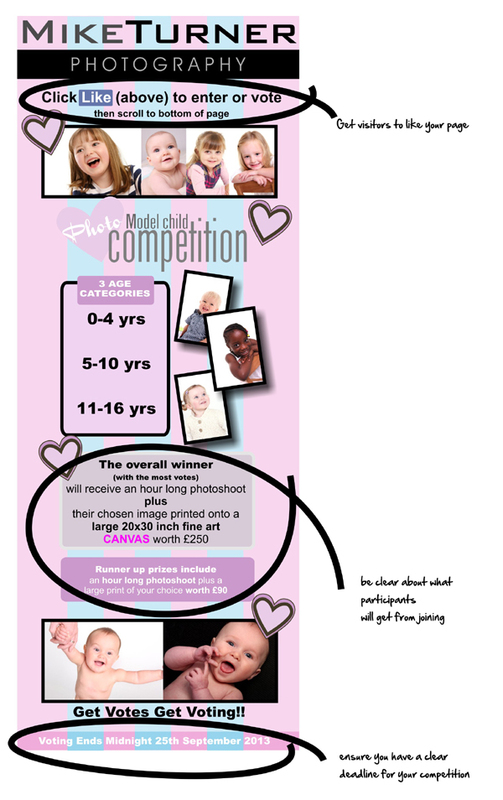 All good reasons to host a photo competition on your Facebook page. We can do all the integration for you, while you just sit back and reap the benefits. Drop me an email for further information. £60 for 2 week competition…you can’t go wrong. I increased my page likes by over 100 within 48 hours, 300 overall, booked in 10 sessions from the competition. You can further boost your competition by promoting it using Facebook’s ‘Promote post’ paid service and aim it at your target market or/and use Google’s Adwords to boost traffic to your page. Both these methods involve investing a little bit more capital, but can significantly boost your competitions visibility. I have used both to get more eyeballs on the competition, which hopefully sells itself once people arrive at the page. You can promote either through a daily budget or lifetime (of the competition) budget, from as little as you like. We would be happy to advise you what has worked for us in this respect. Our aim is to help photographers by providing solutions that equate to profit, that can be easily measured for ROI. We want to build long term relationships with other photographers for the mutual benefit of the industry. Please get in touch with me if you are interested. Below are some pointers about what is important about running your own Facebook Competition. But the internet is evolving so quickly I thought that WordPress, which does 80% of things you need for a good website straight out of the box, would be worth having primarily because of the support it gets from coders that provide plugins for every conceivable thing you could need, most of which are free. I also like the fact that it is so easy to add these plugin, usually a matter of a few clicks and away you go. More and more people are accessing the internet using their mobile phones these days and having a site that is mobile friendly is now essential as far as I’m concerned, I hate visiting websites where you need to scroll from side to side as well as up and down. Having to zoom in to read the text can also be a pain. Whereas if it were mobile friendly the text would be readable and would fit the width of your screen automatically, your images would also resize to fit the viewers screen. Many of the themes you can download and use for your WordPress website are already mobile friendly, and if they’re not you can easily download a plugin which will make it so. This beats redirecting your visitors to a separate mobile version of your site, with the extra hassle and cost that that entails. Talking about themes, the choices are endless with WordPress, you can search hundreds of free themes and paid-for themes. Most can be customised so that you can make it personalised to your brand, allowing you to change text colours, backgrounds, layouts (one column, two or three), add your logo and tag lines, drop in your text from a word processor, it’s so easy with the CMS (content Management System) meaning WordPress does all the coding for you. 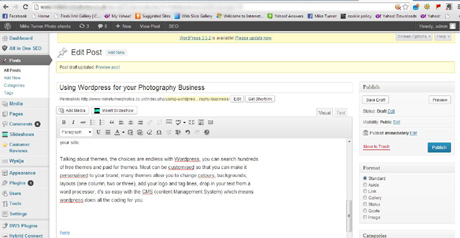 You simply type in the text you want to use for your content, drop in images from your online library or upload from your computer. In short if you are not very technically minded, then a CMS based website is a must for you. Designers will charge you for a custom made one, WordPress is free, it won’t cost you a penny to get from the WordPress website. Your Sitemap is automatically updated and notifies Google and Bing of the changes. Which saves you a lot of time from having to do it manually, assuming you know how to do it manually. The framework and code is clean, meaning Google will find it easier to index your pages, and rank them higher, meaning people will find your site more easily in Google searches. You can add genuine customer reviews to your site, again with the use of free plugins, you can add opt-in forms easily, Social media sharing buttons, Galleries, you can engage more with your audience via the comments on posts.